The knee joint is composed of the thigh bone, (femur) and leg bone (tibia) and a small floating bone at the front, commonly known as the kneecap (patella). The interaction between these bones allows for smooth movement of the knee as it bends and straightens. During movement, the kneecap sits in a groove at the front of the knee and acts as a mechanical see-saw. This protects the knee joint and improves the efficiency of the muscles working to move it. When the patella moves out of this groove it is called a subluxation. If the patella moves far enough out of this groove it becomes a dislocation. The first time the patella dislocates is usually the most traumatic and painful. The knee may give way, and a visible lump can be noticed where the patella has dislocated. There will often be bruising, swelling and the knee may feel unstable. First time dislocations may also cause a heamarthrosis or bleeding within the knee joint. If there is damage to the ligaments of the knee, subsequent dislocations can happen more easily. They can even happen from everyday activities, causing the knee to give way suddenly. First time dislocations often occur due to a traumatic event. 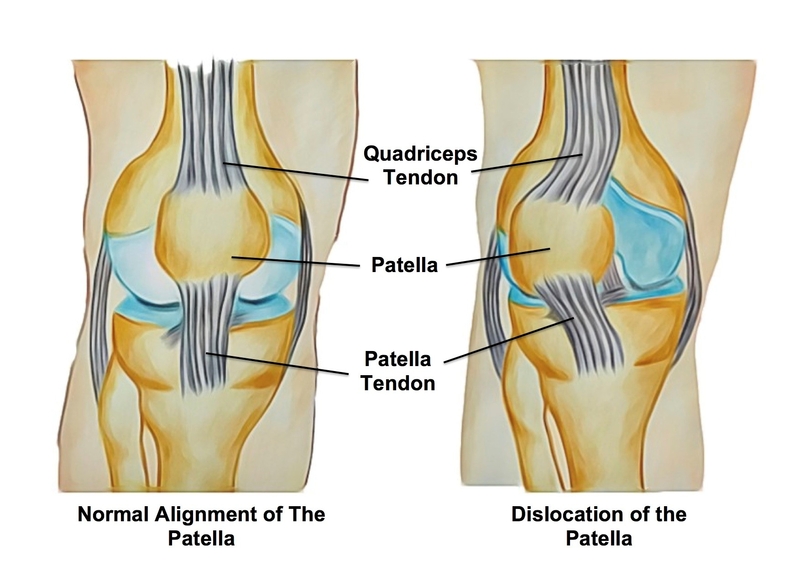 The most common cause of patellar dislocation is a non-contact injury to the knee with a twist of the leg (the thigh bone rotates internally on a fixed leg and foot). In addition, a direct blow to the side of the knee can also dislocate the patella. If there is some instability of the joint, dislocations can occur more regularly and from smaller forces. Dislocations usually occur when the knee is bent and the kneecap slips back into place when the knee is straightened again. While the kneecap can be dislocated in both directions, it usually dislocates towards the outside of the knee. Certain factors can make dislocation more likely, including overall hyper-flexibility, damage to the ligaments of the knee and muscular imbalance of the quadriceps. The structure and angle of the knee joint itself can also make dislocation more likely. This can be seen in the increased prevalence of dislocations for women as they have a slightly different angle of femur compared to the tibia than men. A traumatic dislocation can cause instability that can lead to future dislocations. An acute patellar dislocation should be treated like any traumatic injury and assessed by a medical professional to reduce pain and swelling, make an accurate diagnosis and check for fractures. While the kneecap may relocate itself quickly, ensuring that it is able to heal correctly to prevent further dislocations may require immobilization for up to six weeks. Your physiotherapist will be able to identify any factors that may predispose you to further dislocations and provide you with a personalized treatment program to address any stiffness, weakness or instability surrounding the knee. Balance and proprioception (your sense of where your body is in space) are often reduced following an injury and your physiotherapist will help to rehabilitate these. Your therapist may provide you with education and advice regarding bracing or taping. In severe cases of instability, surgery may be recommended to stabilize the knee however this is usually not considered unless there has been a fracture or until a full rehabilitation with physiotherapy has been completed.